It is the duty of every Muslim to communicate the Truth and nothing but the Truth. Truth is the governing principle of the universe. Truth leads to safety, dignity, success happiness, and peace. 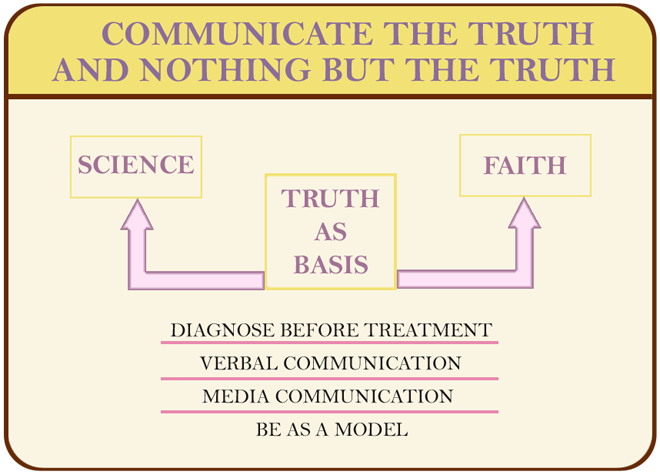 In my objective analysis and study of various religions and modern science, I happened to discover a word 'Truth' in all religious scriptures but is seldom practiced. On the other hand, scientists, who do not profess this word TRUTH, apply in their scientific methods to produce results. Every individual should use this Truth as basis for analysis. If you are in the Truth Paradigm, you are safe and successful in all your activities of life. Ultimately, If this is taken as the basis of Human existence, we can also find balanced development between human achievements and human values. Truth should be the Basis for science and religion. There should not be any prejudices. It is important to understand the untruth before you communicate the Truth. We should never give a solution before we thoroughly understand the problem. A disease has to be diagnosed before therapy. Similarly it is necessary to understand the problems before we give Islamic solutions. Communicate the Truth of Islamic Message through verbal communication and interaction like talk, discussions, lectures etc. Communication through print and electronic media like books, magazines, journals, cassettes, video cassettes, CDs, radio, television, Internet networking etc. This way the Message of Islam can be communicated to humanity. Communication has no meaning if it has no response. A good class has a meaning if it has a good response from the students. Hence it is important to look for the response after communication. We should ourselves be model for others. We should practice what we preach. We should exercise Islamic teachings in all aspects of life.